Welcome to Collaboration Essentials, the Bright Futures Center for Collaborative Education in pediatrics and child and adolescent psychiatry. This site was developed to foster an alliance between pediatric and psychiatric trainees to care for the mental health needs of children in the 21st century. 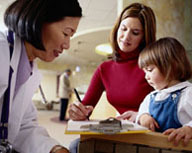 It describes the technique of case-based discussions to encourage problem-based learning in the psychosocial developmental aspects of child health. Three cases are presented. Each case is downloadable in .pdf format, and includes the case narrative, discussion guide, and topically relevant handouts. Guidelines for effective case discussion and a sample evaluation are also available. These materials have been written and edited by faculty from Children's Hospital in Boston and Harvard Medical School and are freely available to pediatricians and child and adolescent psychiatrists worldwide.